Many of you know that I recently moved countries from Belgium back to the UK (more of that in another post) so you can probably sympathise with the fact that I have been drowning in a ridiculous amount of unpacking from a series of white and brown dull card box boxes. 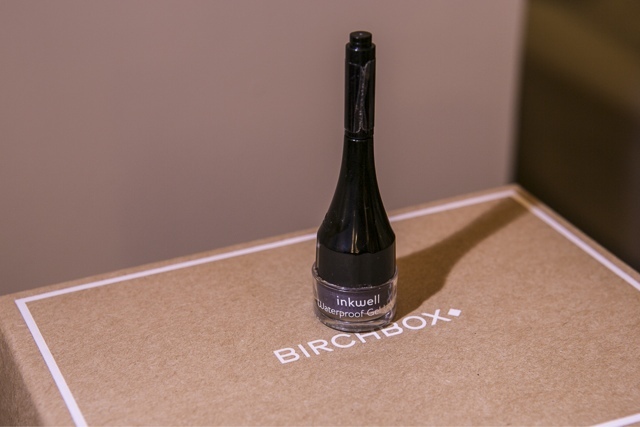 Now it might surprise you to know that despite my love for beauty, I don't actually subscribe to any of the beauty subscription services, so I was pretty excited when I was asked if I would like to review one. So onto the review. I am a sucker for anything pretty and well presented, so when I opened the pretty pink box to reveal yet another pretty box wrapped in a lovely ribbon, which then revealed a cute draw string bag, I was pretty much sold. Unwrapping it felt like Christmas and my Birthday had come round together at once. It also contains 4 adorable and destination inspiration postcards for New York, Paris, London and Barcelona ( definitely making me want to go on holiday) as well as the Birchbox Magazine which was an interesting read and included a couple of recipes that I can't wait to try. Having been living in Belgium, I have grown to love French skincare. 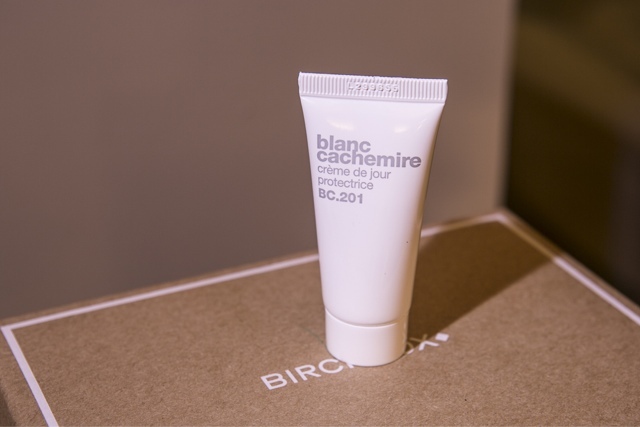 Blanc Cachemire is a brand I have heard about but had yet to try so I'm really looking forward to trying out the moisturiser. The Beauty Protector detangling spray smells absolutely gorgeous and worked amazingly well on my hair. I tried it out yesterday when I took out the birds nest of a bun I have had on my head for the last week (all hair regimes have been non existent since I moved house) and it really helped to make my detangling process a lot easier. The only annoying thing was that my spray pump didn't work, which meant I had to open it up to tip out the spray and this made it a little difficult to evenly distribute the product. I also received a full sized Laura Geller Inkwell Waterproof Gel Liner. Not a brand I have heard of before but I love that it wasn't in the usual black, but instead is a gorgeous looking purple! Very different for me so I'm looking forward to trying it out and will write a full review post on this in the future. 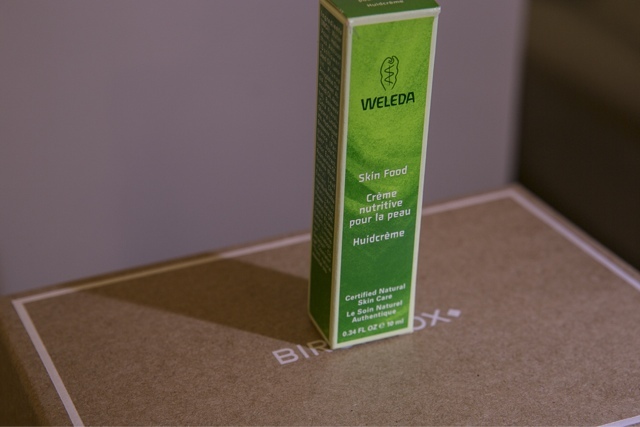 Weleda is one of those well loved brands that again I haven't tried yet so I was pleased to receive Skin Food, which is a celeb favourite moisturiser that helps to hydrate and soften the skin. 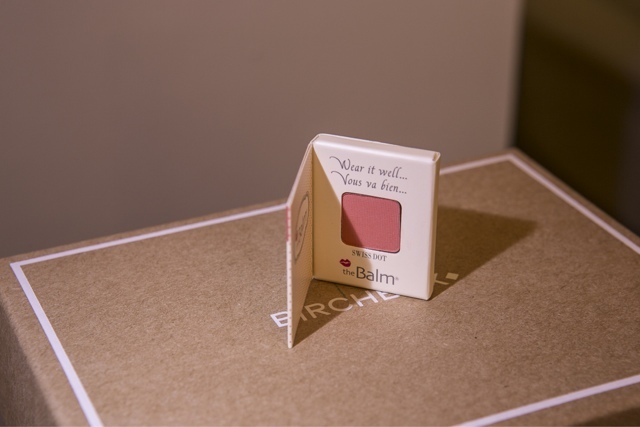 The final beauty product in the box was a blush from theBalm cosmetics . My initial reaction when I opened it was adorable packaging but I'm not convinced about the colour. Boy was I wrong! The colour was absolutely gorgeous when I put it on and all I can add is that it went on so velvety silky and smooth and builds up very nicely although a little does go a long way. 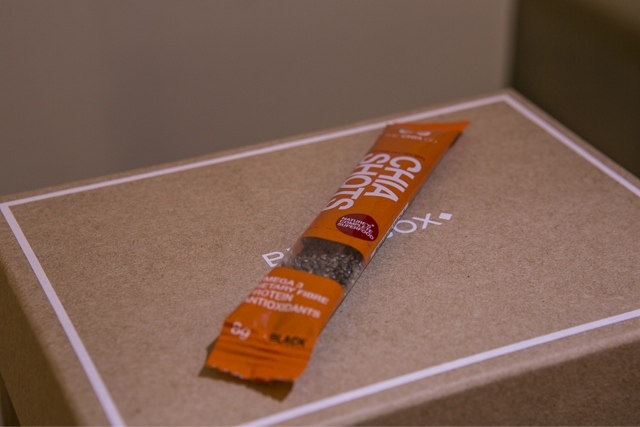 The bonus product/ lifestyle extra was the packet of Chia seeds which are naturally high in Omega 3, protein, dietary fibre and antioxidants. Now I love my green smoothies which I usually have every morning and recently have been looking at ways to boost up my smoothies (chia seeds are one of the ingredients I have been looking at) so I love that a sample was included as it means I can try it out first to see if I like it. 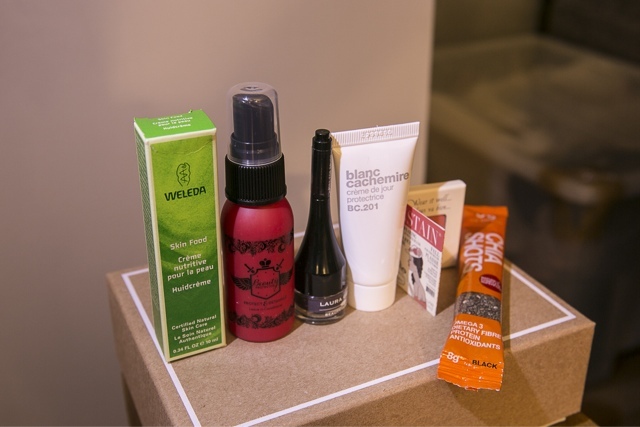 I also loved that they included a health boosting product in the beauty box as I am a firm believer that beauty starts from the inside out. 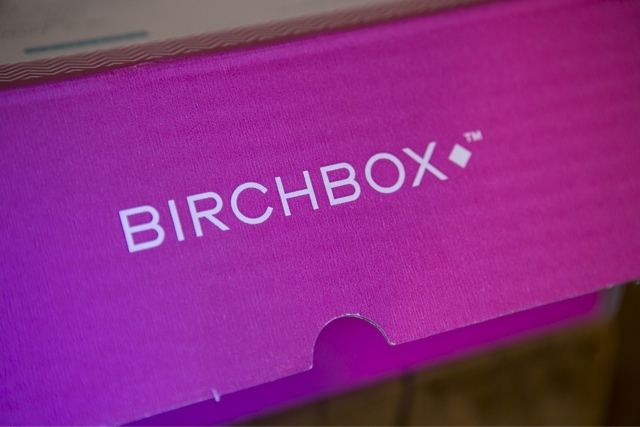 Final verdict: Having never tried a beauty subscription box, I was very impressed with Birchbox as well as this months contents. 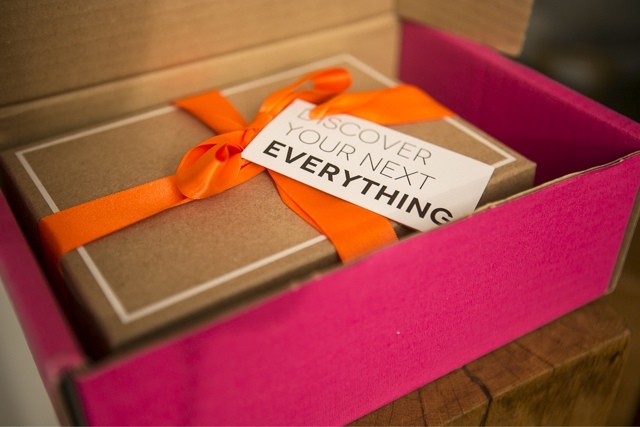 The collection of products definitely matched up to their tagline of "discover your next everything" as I have discovered quite a few new things, I have loved the things I have tried so far and am looking forward to trying the rest. Would I change anything? I think I would have to try a few more boxes to really answer that question but my suggestion for this box would probably be to maybe not to have two of the same types of products as there were two facial moisturisers. However I personally was happy with both as they are brands that I have had on my list to try. 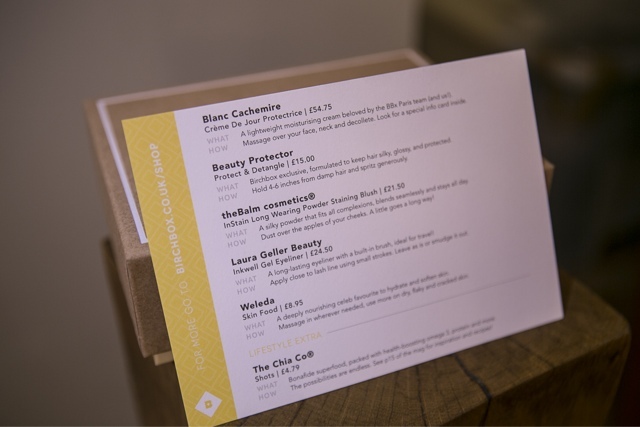 You can find out more about Birchbox at www.birchbox.co.uk and the subscription retails for £10.00 + £2.95 p&p monthly.